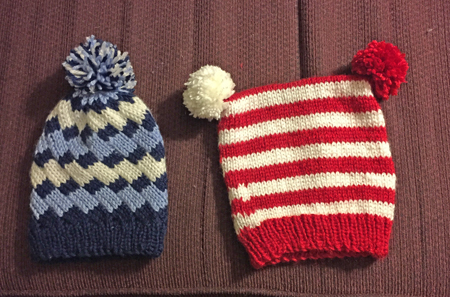 I knit 2 hats for my grandson. 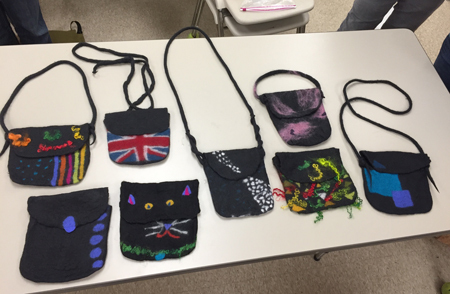 He requested the one on the right, identical to one I’d made for his little brother last year. I made the one on the left in his school colors, which he’s definitely into. I don’t know if that one will fit or if I’ll need to remake it in a larger size. I found the pattern on the internet, but didn’t mark it and can’t find it now. 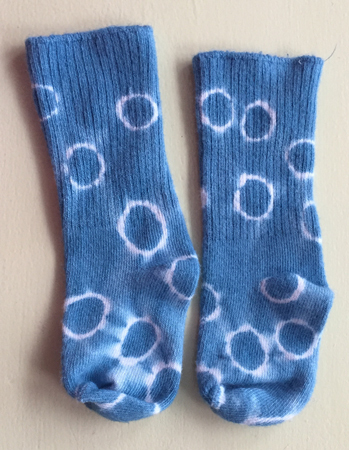 I decided at the last minute to dye some socks for my 2 grandnephews. I had 3 pair that I thought would fit them, so used 1 method I knew would work and tried 2 others. First up is the known method – tying in marbles with little rubber bands. Then the pair that didn’t work as well – but I know how to make it work next time. 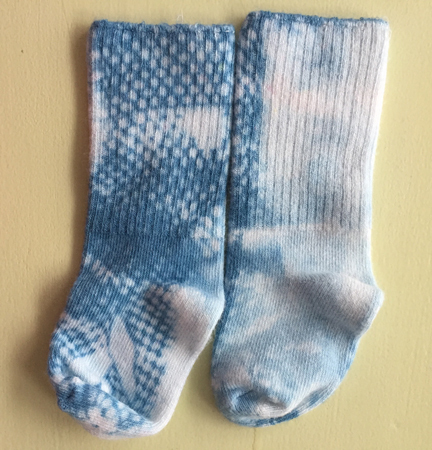 One side of these socks look cool, but the ‘inside’ didn’t get any dye. Next time the rubber should be clamped onto both sides of the socks. The 3rd pair was also successful. First I mildly scrunched them on a length of PVC pipe. I knew from experience that too much scrunching on the PVC would leave too much white on the socks. After the mild scrunching I wrapped them in rubberized shelf liner, then tied it on with some rubber bands. I like the results of this experiment. 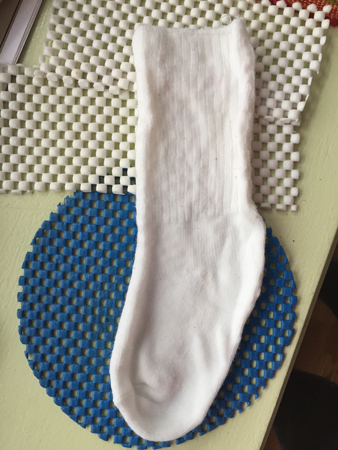 Those socks got mailed out yesterday. Now I’m working on a modified circle shawl. 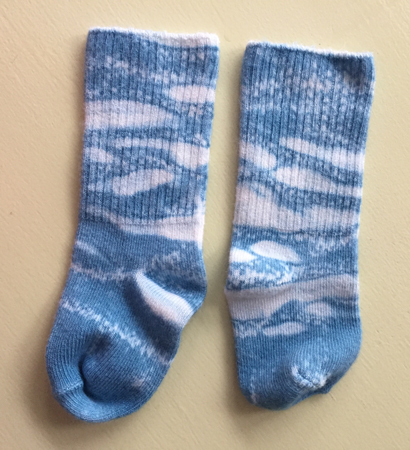 I used an online random stripe generator, going through at least a dozen variations produced, and warped with 8 colors of 8/2 unmercerized cotton. I’m using an interesting flecked wool for the weft. We’ll see how it all works. I also hand painted a bunch of 8/2 tencel, preparing for a series I’ve mentally planned in black and white. 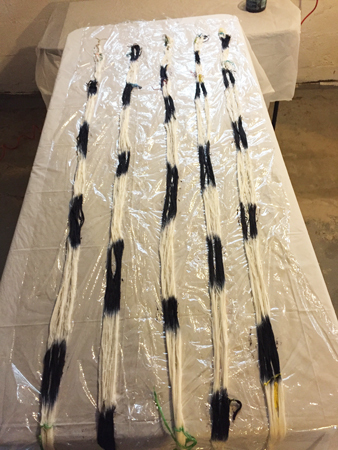 This dyeing has also been a learning experience…the black hasn’t always behaved well, even though I actually did dye samples (regular readers will know I almost never sample). I’ve also added more time learning dances with the ROC City Line Dance Express group. Those women are GOOD! And make me feel good, even though it takes me LOTS of practice with YouTube videos to learn the steps. For the next few days I’ll be cleaning, wrapping gifts, and otherwise preparing for the holiday. 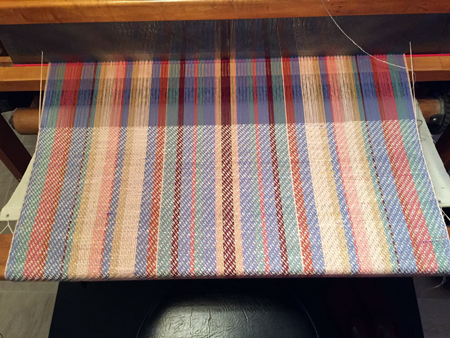 I may be able to fit in some more time at the loom on that striped warp…or maybe not. Yes, Theresa, I have been busy. Jack’s feeling much better, and with yesterday’s grooming looks, feels, and smells great, too. The only things wrapped so far are the things that had to be mailed. In fact, I have to head to the post office as soon as I’m done typing! Do you need a copy back of the slanty hat? The blue sox are terrific! Thanks, Alma – I have a copy in Word, just not the original online reference to send others to it.